An interesting question was posed to me on Dr. Curry's post recently at her blog Climate Etc. The question and my answer are shown below, but first a bit of background. 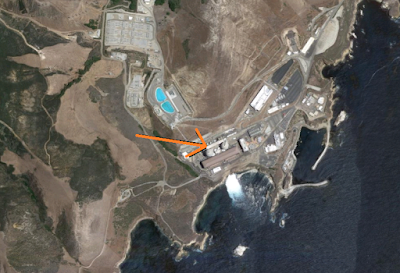 Diablo Canyon Nuclear Plant, via Google Maps 2016. Arrow idicates twin reactors. Pacific Ocean to the bottom right. California has but two nuclear power reactors left running, both at the Diablo Canyon nuclear plant near Morro Bay, right on the Pacific Ocean shore. The 40-year operating license for each reactor expires in a few years, and PG&E announced it will not seek a 20 year license extension but will shut them down in 2024 and 2025, respectively. Also, PG&E announced it would compensate for that power by a mix of renewable energy, conservation, and grid storage. My June, 2016 article on this on SLB is at this link. The increased renewable energy likely poses several issues for the grid operator. The short answer is probably Not. The long answer is more complex. The law requires PG&E (and other Public Owned Utilities) to procure 33 percent of their power sold in 2020 from renewable sources. PG&E is reported to already have under contract 43 percent renewables for 2020. The next milestone for RPS is 50 percent by 2030. Clearly, PG&E must find a source of more renewable energy to meet the 50 percent requirement. With Diablo Canyon nuclear to close the reactors in 2024 and 2025, that gives PG&E an opportunity to obtain approximately 2,200 MW of power from renewable sources. However, RPS does not work on installed capacity, it requires kWh delivered to be from renewables. As most everyone knows (and detractors cannot stop shouting it), wind and solar renewable power do not run 24/7, they have approximately 25 percent annual capacity factor in California. Thus, about 8,800 MW of either wind, solar, or both, would be required to replace the retired nuclear output. However, installing that much renewables would likely create grid issues, and put PG&E in the 60-percent range for RPS. The state does not have very much, if any, untapped wind resources left, so the new installations will be solar. The economics of solar thermal are not as good as solar PV, therefore the new installations will be solar PV. The main point is that solar PV must have some form of backup due to intermittency with sunshine. Those aspects are well known, from night, to clouds in daytime, to seasonal variation, to solar eclipses (a big one is coming in August 2017), and to normal outages for maintenance. The usual backup in California is natural gas-fired plants that use combined cycle gas turbine (CCGT) technology. Indeed, CA law requires a minimum efficiency for fossil power plants that essentially dictates that only CCGT can be built. Therefore, it is safe to conclude at this time that PG&E will very likely build, or purchase power from, approximately 8 to 10 GW of new solar PV in the next 7 to 8 years. That will also require the installation of some amount of gas-fired CCGT. The situation would change if and when grid-scale batteries (or other storage) are sufficiently economic to be installed for baseload power. The economics for batteries are already good for peaker power plants. Whether the battery installed cost declines sufficiently by 2022, when investment decisions must be made, of course is not yet known. I do not always agree with what Planning Engineer writes, but on one thing we do agree: a large amount of solar power on a grid creates the problematic Duck Curve. California is already managing very well with a substantial Duck Curve, with recent numbers showing thermal generation in mid-day at 11 GW and 26 GW at the peak 8 hours later (data from 4/29/2017). However, if an additional 8 to 10 GW of solar generation is installed, the grid would have thermal generation of 2 to 3 GW in mid-day, then must produce 26 GW only 8 hours later. That is a problem for the grid planners and operators. It remains to be seen how all this will play out.